Josh Rivedal and Adam Rothenberg at Gossip Bar in NYCJosh Rivedal is an actor, playwright, and international public speaker. From Gossip Bar (733 9th Avenue) in NYC's Hell's Kitchen, Call Me Adam recently sat down with Josh to catch up with him about his one-man show The Gospel According to Josh and his new book, The Gospel According To Josh: A 28-Year Gentile Bar Mitzvah, which is currently in pre-release (15% of proceeds will be donated to The American Foundation for Suicide Prevention), with wide release on September 24th. For more on Josh be sure to visit http://gospeljosh.com and follow him on Facebook and Twitter! He wrote and developed the play, The Gospel According to Josh, which has toured extensively throughout the United States and Canada, and opening Off-Broadway in New York City in May 2014. He wrote the libretto to a Spanish language Christmas musical Rescatando la Navidad, opening in Miami in November 2013. Josh has been published in Personal Branding Magazine. 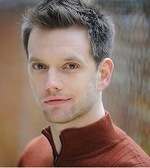 As an actor, Josh has lent his voice numerous national television commercials, audiobooks, and animated projects including the role of Hippo in Scholastic’s Rabbit and Hippo In Three Short Tales, the narrator of Julianne Moore’s Freckleface Strawberry and the Dodgeball Bully, and description for seeing impaired children for NBC’s Tree Fu Tom. Josh has spoken professionally about suicide prevention and mental health awareness in more than twenty-five U.S. states and two Canadian provinces. He serves on the board of the New York City chapter of The American Foundation for Suicide Prevention.